Quentin Tarantino takes on the Western and creates a bloody feast. Django Unchained marries Tarantino's love of excessive violence with the outlandish sensibilities of Spaghetti Westerns to exact sweet revenge on slavery's brutality. Dr. King Schultz (Christoph Waltz) is a German bounty hunter criss-crossing the deep American south just before the Civil War. He seeks the services of the slave Django (Jamie Foxx), who helps Schultz to identify and eliminate three wanted criminals on the ranch of "Big Daddy" Bennett (Don Johnson). 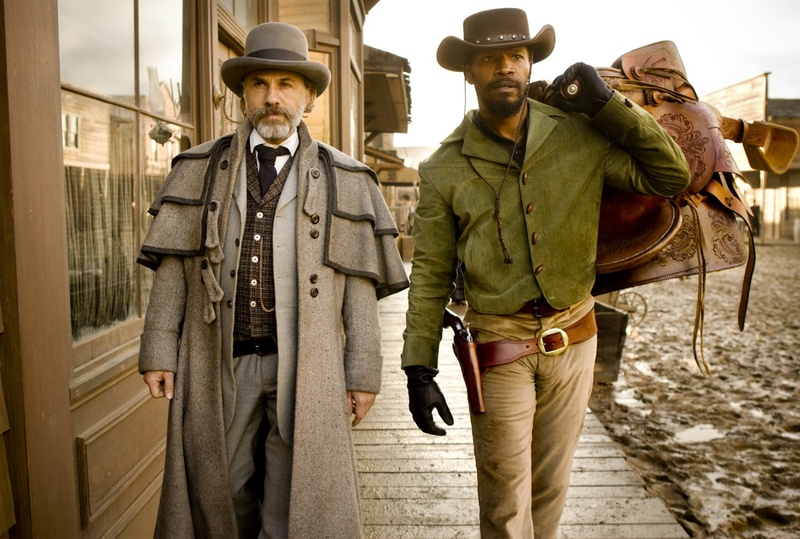 Schultz gives Django his freedom, and the two men become partners, hunting down wanted men and cashing in large bounties. Django also hones his shooting skills and becomes an ace deadly marksman. The two men then embark on a mission to find and free Django's wife Broomhilda (Kerry Washington). They track her down to the sprawling plantation of megalomaniac Calvin Candie (Leonardo DiCaprio). Pretending to be interested in purchasing slave fighters to attract Candie's attention, Django assumes the distasteful role of a black slaver advising Schultz, and the two men spend an evening as Candie's dinner guests negotiating a deal. When Candie's loyal head slave Stephen (Samuel L. Jackson) begins to suspect that Schultz and Django have no real interest in slave fighters and are really only after Broomhilda's freedom, the evening's civilities disintegrate rapidly. With liberal use of the "n" word, Django Unchained wastes no time in establishing its purpose as a reminder of the time when slavery in the South was part of the social fabric, less than seven generations ago. 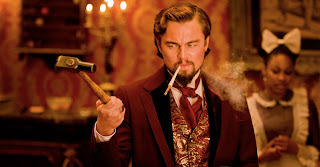 Much as Inglourious Basterds was a dream Jewish revenge story, Django Unchained is a fairy tale of vicious black revenge on the evil white men who propagated the worst excesses of slavery. Tarantino is not satisfied with the generalities of slavery as an evil concept. He builds from mere inhumane men-in-chains treatment to abhorrent whippings, burning with irons, punishment in underground cells, and then delves into the depraved world of slave fighting. The entire slave fighter sub-plot is unnecessary for the film's narrative, but used as an exclamation mark to the brutality of an era that had to end. The movie layers on the abominations to justify the essential bloodbath that Tarantino predictably unleashes on the screen in the final 30 minutes. And when the blood finally flows, it gushes, Tarantino literally painting the walls, ceilings and floors red with a series of wild massacres, spiritually cleansing perhaps but nevertheless almost incomprehensibly messy. Apart from the violence, the other Spaghetti Western echoes are strong, including the music, scenery, humour, camera angles, and prevailing unbathed look of the numerous extras. At a mammoth 165 minutes in length, Django Unchained aims more for the duration of epics like The Good The Bad And The Ugly, but past the slavery context carries a much simpler revenge tale more suitable for a significantly tighter running length. The padding is occasionally exposed, an entirely superfluous raid by "Big Daddy" and his men turning to a mildly unfortunate comedy routine. Christoph Waltz delivers his usual smoothly hypnotic performance, a German ironically - and rightfully - acting all superior to the barbarous southerners, holding all the answers and sure of the direction in which American society must evolve. Jamie Foxx is less showy as the film's centre of gravity, a man seizing a most unexpected opportunity to gain freedom and then unleash justice in the name of love. In the tradition of many Western heroes before him, Foxx allows others to do most of the talking while communicating mostly with a multitude of guns and a hail of bullets - explosives optional but always helpful. Leonardo DiCaprio takes the role of Calvin Candie and sinks his teeth into it with relish, Candie a brute in gentleman's clothing, preferring to be addressed as Monsieur Candie but not understanding a word of French. When Candie's anger is unleashed, DiCaprio lets loose in a terrifying rage, having fun filling the screen with Southern bravado. In addition to Don Johnson and Samuel L. Jackson living up larger-than-life roles, Tarantino finds space for the likes of Dennis Christopher, James Remar, Bruce Dern, Jonah Hill and Robert Carradine. And Franco Nero, the one and only original Django, has one scene, passing the bullet-riddled Western torch across 46 years of movie making. Django Unchained is stylish exuberance, amplifying a sub-genre that celebrates parody to construct an exaggerated revenge tale, painted in gory red.